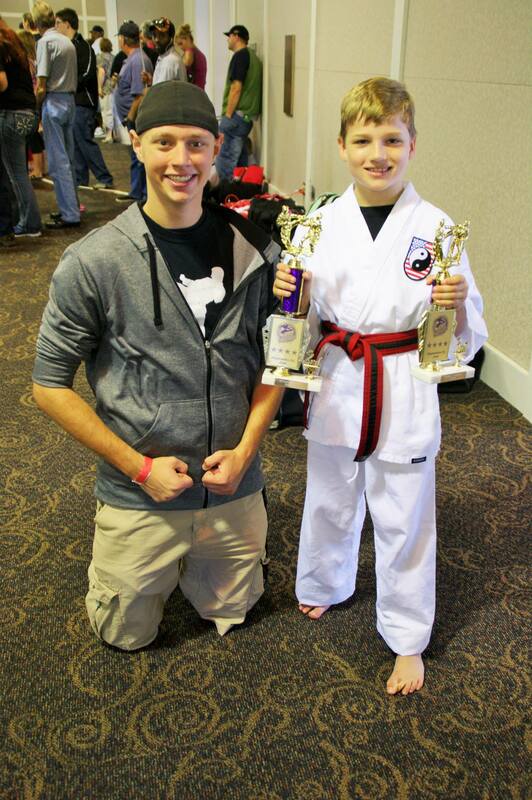 The last weekend of September, Michael competed in his 2nd karate tournament, the Minnesota State Karate Championships. It was held at the Earle Browne Heritage Center; a nice location with plenty of room for the tournament. 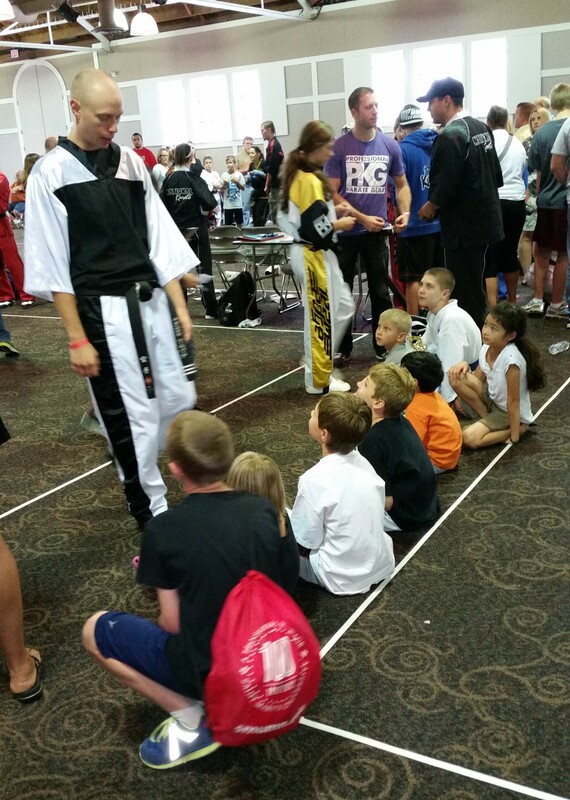 This tournament was significantly larger than the first one he competed in last summer. Team Forte has grown tremendously. So much so, that the two Forte’s locations have split into two teams (all competing as representatives of their studio). Michael had many friends from his team competing that day. What was really cool, was that all teammates cheered each other on (unless they were competing in separate rings at the same time). The camaraderie I saw that day was impressive! 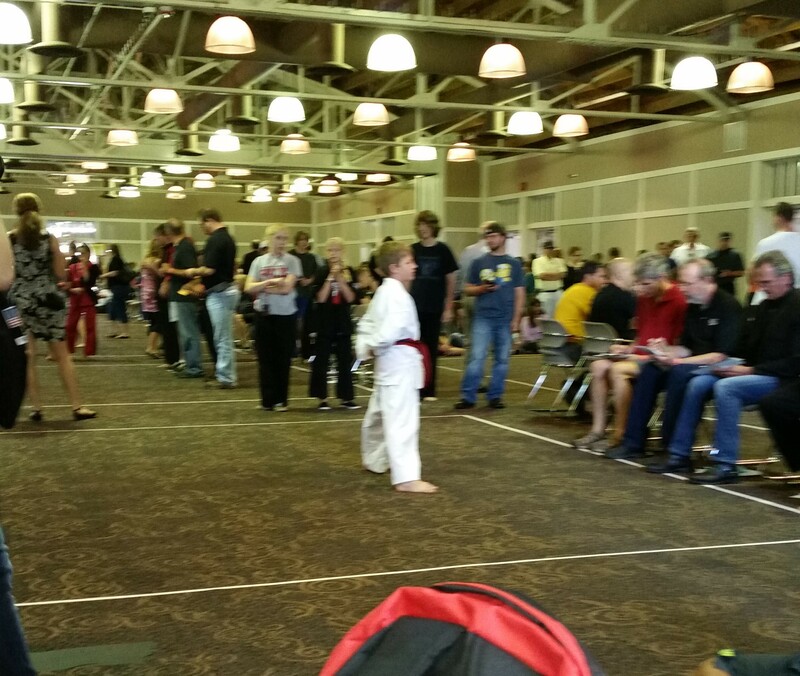 Michael was really nervous for this tournament, because it was going to be his first time sparring in a tournament. He also knew he went way too fast in the last tournament with his form, and he needed to slow it down. I was so thankful for Mr. Munson, one of the black belts who had previously been his teacher, for being there. He pulled Michael aside and helped him calm down. He told him to remember his yells on the power moves. That the reason for those yells, was to help you remember to breathe, and to take a pause. This would also help him slow down. The advice helped, because he did a really great job on his form! He ended up taking 3rd place, but easily could/should have had 2nd. Later in the day, one of the ring judges, a Grandmaster (10th degree black belt), complimented Michael on his kicks. He also told Michael that he had him at 1st place in his mind. I’m not sure Michael realized what an honor that was! 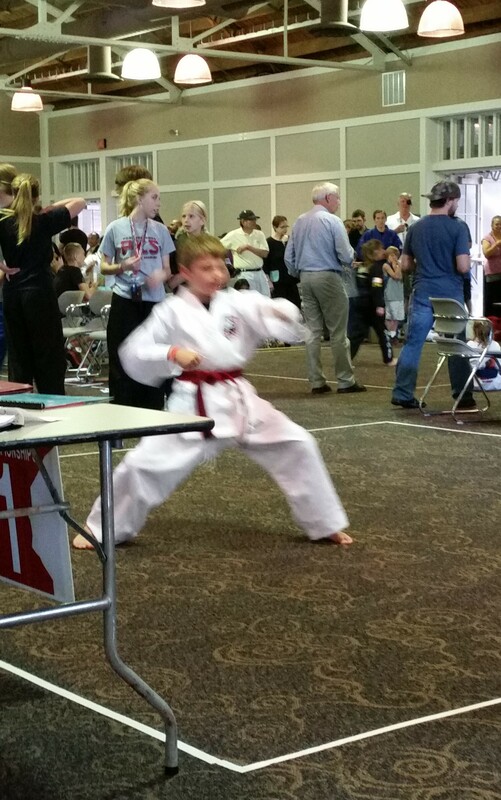 Michael is the red belt in the white uniform. Two of the three kids in the corner are friends of his from Team Forte, the other is their little sister. After forms were done, it was time for sparring. This mama had flashbacks of being about 17, and sparring in a tournament. I got a really hard side kick to the chest that knocked the wind out of me. I had never had this happen before, and started to cry. I was in pain from the kick, and felt humiliated for crying in the ring. My fear was that this would happen to my poor 9 year old son, and there was nothing I would be able to do about it. Luckily, it was nothing like that! Nowadays, they have head gear and chest pads, in addition to the hand and foot pads we had. The match started, and I was so nervous for him. Then I remembered, or rather he showed everyone, his awesome kicking skills. I think he forgot he also had hands that could be used for anything but blocking in that first round. This worked in his favor though, because points earned with kicks receive 2 points, while points earned by punches are only worth 1. He won his first round. I was so excited for him! The second round, he found his hands, but forgot about his feet! Unfortunately, when the opponent is scoring 2 points at a time, and you are only scoring one, you don’t win. It was a great match though! I was very proud of how hard he fought, and yet, kept his control. It didn’t even seem to bother him that he didn’t win that round. In the end, he took 2nd place in sparring. Later in the day, I introduced him to Master John Lysaght, from USA Karate. He used to train with Master Forte. I knew him as a parent of a past preschooler. 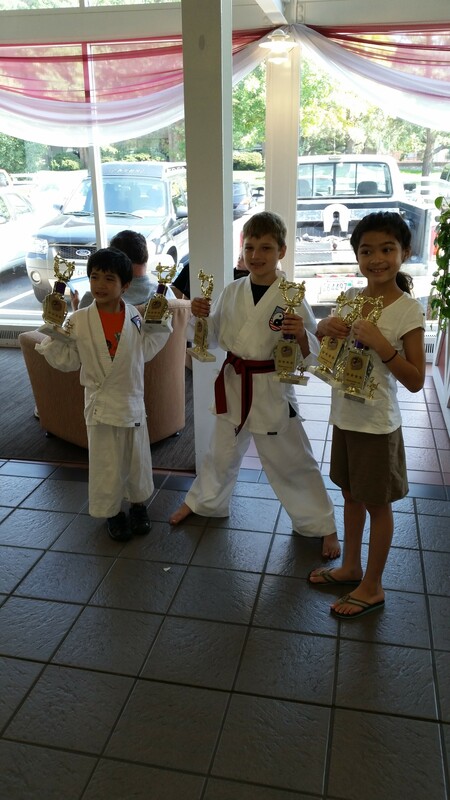 When Master Lysaght asked Michael what his favorite thing about karate tournaments was, Michael said, “Hanging out with my friends. When we are at karate, we don’t just get to hang out.” Fair enough. I’m glad he doesn’t feel so much pressure that he loses his enjoyment of the day. I got to watch Master Lysaght compete with a musical form later in the day. He did awesome! Back when I competed, those were my favorite to watch! Must be my dance background that makes me love forms set to music so much. At the end of the day, Mr. Hallberg, Michael’s current teacher, and a 3rd degree black belt, was competing in sparring. Much of Team Forte’s Spartans (the White Bear branch of the team) stayed to cheer on Mr. Hallberg. It was a whole different ballgame with the black belts! They wore head gear, hands and feet, but no chest guard. The hits were much harder, and there were many to the head. 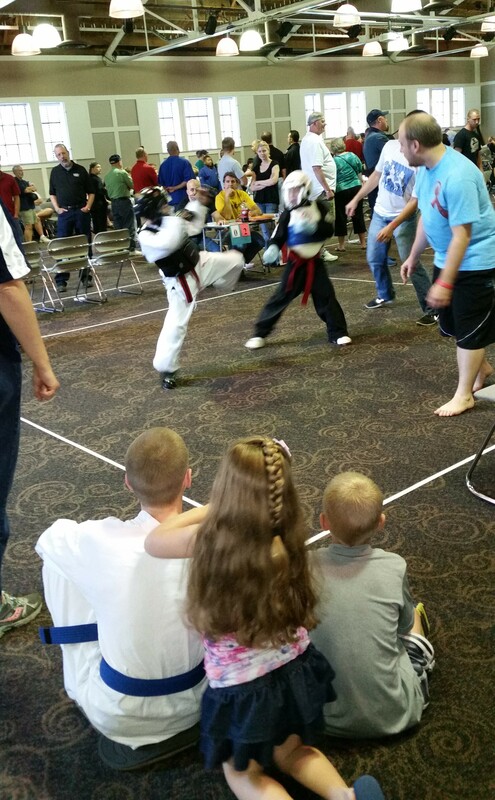 The kids seemed a bit concerned, though he did an amazing job sparring! He won the first match, and his minions went wild! Unfortunately, he didn’t win the second match, but he fought hard. Some members of Team Forte with their trophies from the tournament.